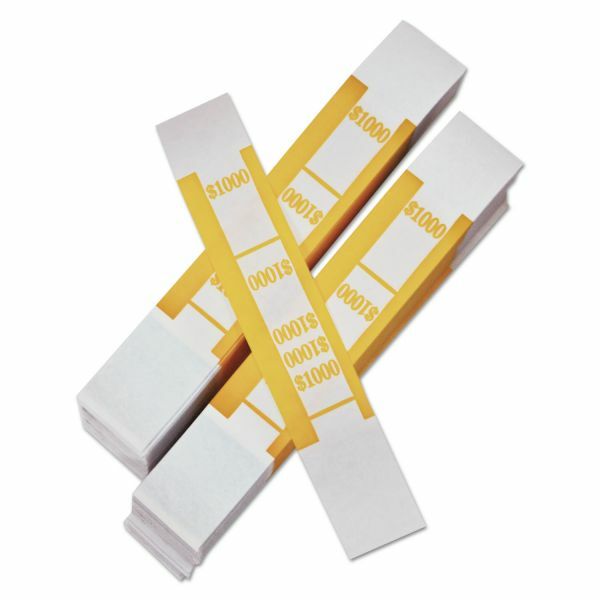 PM Company® Self-Adhesive White Kraft Currency Bands, Color-Coded. Each 7-7/8" long band has 1-1/4" wide strip of self-sealing adhesive to accommodate varying quantities of bills. Self-stick adhesive ends. PM Company Color-Coded Kraft Currency Straps, $10 Bill, $1000, Self-Adhesive, 1000/Pack - Currency straps contain adhesives that hold currency securely with a simple touch and seal. Made of strong, sturdy kraft paper, these currency supplies meet OEM specifications and are color-coded to Federal Reserve and American Banking Association (ABA) standards for easy denomination identification.